Our six new releases are the cannabis strains to grow in 2018. If you want sweet sugary stacks of superior Sinsemilla you need World Star genetics. To create the Spring 2018 cannabis collection we’ve strain-hunted, selectively bred, and refined genuine royal dankness. The contemporary cannabis cultivator is a cannabis connoisseur. We recognise if you are willing to invest your personal time, labour, and cold hard cash in growing your own marijuana not only do you expect the best, you deserve the best. 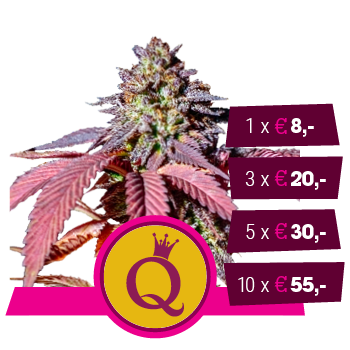 That’s precisely why the master breeders at Royal Queen Seeds have engineered game-changing photoperiodic and autoflowering strains for the 21st century home grower. Harnessing the power of the most sought-after genetics from across the globe we have successfully developed 6 unique modern classics just in time for Spring 2018. Now is the time to make homegrown great again and these are the strains to do it. We guarantee 100% royal dankness, accept no substitutes. Imperial purple sparkling resin encrusted buds are your dank reward for treating Purple Queen with the basic grower TLC. Her Majesty might have diva looks, but rest assured she is low-maintenance. Heavy-duty dreamy indica from the Hindu Kush is rare dankness. In the past, you had to be very lucky to find a purple phenotype. Now you don’t need luck, and to be honest you don’t need previous cultivation experience either to hit the jackpot with a fat harvest of purple Kush. All you need this Spring is a pack of Purple Queen. Once you’ve tasted her rich, earthy and slightly lemony smoke you’ll be a very stoned loyal subject. Best of all it need not be a long reign in the grow room before you can indulge in 20%+ THC pure Dreamland stash, as flowering takes just 8 weeks. What would you toke right after you slew a dragon? The answer is Fat Banana. For the fearless weed warrior fond of the odd banana split, this strain is the one. Knockout OG Kush power and concentrated fruity banana flavour set this Sinsemilla apart from all others. To achieve this dank synthesis we combined prized Banana OG specimens. Fat Banana is capable of touching 25%+ THC. This marijuana will creep up on you and turn you into a jellyfish if you overdo it. Long-running Fat Banana colas can stretch quite a bit during the brief 8–9 weeks of bloom. But they will also pack on the bud weight deliciously. Prepare yourself for diamond dessert cannabis flowers sparkling with trichomes like the eyes of a cat. Royal Cookies Automatic is our take on easy bake. By blending Royal Cookies with hardy ruderalis we have successfully retained the signature biscuit aroma and thin mint cookie aftertaste without compromise. This strain really is an express delivery of gourmet cookies with 18% THC. Plants will race from seed to harvest in 8–10 weeks total and still acquire a larger, more productive stature than the average auto. Savour the sweet confectionery flavour and enjoy the initial euphoria before the heavy physical high takes over. Can you handle the truth? We think you’re entitled to it. Royal Gorilla Automatic is the King Kong of all autoflowering cannabis. Smashing through the 20% THC ceiling and smoking the competition. Woe to the vanquished! Now nobody can claim that autoflowering cannabis cannot surpass photoperiodic varieties. As a complex blend of Royal Cookies, Royal Gorilla and resilient ruderalis genetics, this beast is a new breed of super-sized auto hybrids with a larger size and heavier yield. Mature plants can easily exceed 1m in height and branch well to fill out the grow space. By the way, she does it all in an 8–10 week complete lifecycle. Royal Gorilla Automatics gooey buds will render even veteran tokers pleasantly couchlocked. Dessert cannabis just got a whole lot tastier. Sticky green ice cream is now being served at the RQS banquet of dankness. Baked, errr blooming in 8–10 weeks. Bred using the most delicious organic ingredients from the West Coast, connoisseur favourites Thin Mint Cookies and Sunset Sherbet come together to create Green Gelato. Sweet confectioneries with a shot of orange citrus takes her flavour profile to the most sumptuous summit. That’s not the only attribute Green Gelato shatters the mould with. THC levels of 27%+ command respect. A frosty nug-sized scoop is more than capable of couch-locking anyone. A hulking Kush like no other will smash European cannabis culture. The green monster has arrived. Hulkberry is here, and head stash will never be the same again. Bruce Banner would never have lost his temper if he toked on some Hulkberry. A cerebral trip to pacified paradise is so powerfully uplifting, it could even turn the Hulk into the Jolly Green Giant. Mere mortals without superpowers can expect a euphoric surge and flurry of creative energy. Beastly sugar buds will be ready for harvest after 8–10 weeks flowering. Hulkberry harnesses the power of OG Kush and Strawberry Diesel to generate the gooiest 27% THC Kush nugs.